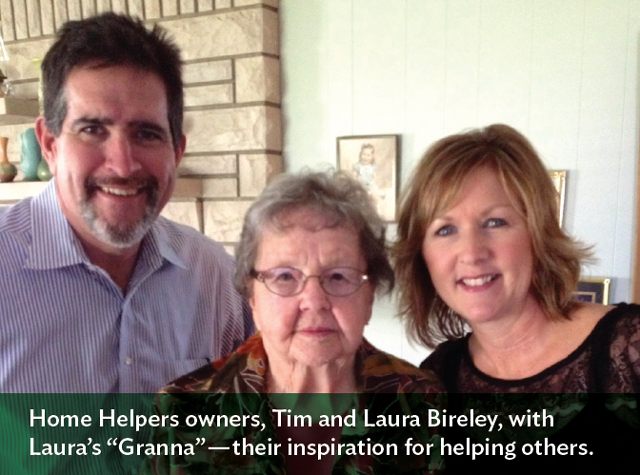 At Home Helpers, we meet families every day who are struggling to care for aging loved ones. These daughters, sons and spouses describe how they can’t enjoy their family relationships any more because their caregiving duties are overwhelming them. This loss of choice and control has been so prevalent in these conversations that we started identifying this problem as the Caregiving Dilemma. I personally experienced it while caring for aging family members of my own some years ago, and it seems that more and more people are dealing with it these days. They come to our local senior care agencies for help when they realize it’s not worth agonizing over the Caregiving Dilemma alone anymore. My friends and colleagues, the franchise owners of these local Home Helpers offices, are on the front lines of this issue. They’ve been gracious in sharing their experiences with me, and today I’d like to share some of these stories with you in the hope that they might help anyone currently struggling with the Caregiving Dilemma. A caregiver at Home Helpers of San Mateo with her care client. Sam Sellers, the owner of Home Helpers of Little Rock, Arkansas, had similar words to share. Recently, two different cases of the Caregiving Dilemma walked in his door. In the first instance, it was an older woman whose husband was living with Alzheimer’s disease. In the second, a woman’s mother had fallen and broken a hip, and her father was in the later stages of Alzheimer’s. “In this case, the primary caregiver is the wife and she has been diagnosed with pancreatic cancer. Her husband, who adores her, has Alzheimer’s. He cannot care for her now and she can no longer care for him. They have no children. Nearby relatives have tried to provide care around the clock but they have quickly learned that the task is too great for them. There are meals to prepare, doctor’s appointments, and household chores to be done. There are bed baths, a potty chair that needs emptied, and medicine to manage. Kim McCutcheon and her team participate in the Walk to End Alzheimer’s. These families eventually came to the conclusion that extra hands were needed, and we take pride in our ability to help them restore balance in their lives. “Whether it’s a health crisis, or simply an acknowledgment that they can no longer successfully manage the needs of their parents along with the needs of their own lives—that’s when we get the call. With empathy and caring, we’re able to help lower their sense of guilt and of being lost. We simply guide them down the path of how we can help. When asked about how they have been able to improve the lives of families stuck in the Caregiving Dilemma, Kim, in Alabama, and Sam, in Arkansas, had nearly the same words. 2) Don’t do everything by yourself. 3) Hire only the best senior care available. Are you navigating a new caregiving situation and need some advice? Feel free to contact us or comment below. You can also follow us on social media for daily advice and inspiration. Find us on Pinterest, Twitter or Facebook.